ABDULLAH, Muhammad Wahid and PUJIYONO, Arif (2016) ANALISIS STRUCTURE-CONDUCTPERFORMANCE INDUSTRI PERBANKAN SYARIAH DI INDONESIA TAHUN 2011-2015 (Pendekatan Two Stage Least Square). Undergraduate thesis, Fakultas Ekonomika dan Bisnis. 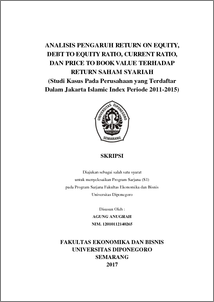 This research aimed to analyze the structure, conduct and performance of Islamic banking industry in Indonesia with SCP approach. SCP paradigm explains that the structure, conduct and performance is an endogenous variable, as interdependent each other. This research also analyzes the effect of bank size (BSZ), market size (MSZ) and cost intensity (COST) against endogenous variable, market share (SHARE) as proxy of structure, selling intensity (SELL) as proxy of conduct and return on assets as proxy of performance. This research use panel data with time range of first quarter in 2011 until fourth quarter in 2015. Research’s Model is simultaneous equations model that identified as overidentified model, with the result that method to analyzing in this study is Two Stage Least Square. The market structure of Islamic Banking, industry in Indonesia identified as high oligopoly. The result show that bank size and return on assets has positive influence on market share, but selling intensity has negative influence. In conduct equation market share has negative influence on selling intensity, while return on assets has positive influence. In performance equation selling intensity has positive influence to return on assets, but cost intensity has negative influence.